Last week we heard an excellent sermon here at All Saints Church of Christ on the Pharisee, Nicodemus, of John chapter 3. And I’d like to compare and contrast the Samaritan Woman and Nicodemus just a bit this evening. Nicodemus was a man, a Jew, a teacher of Israel, a member of the religious elite. He was an insider to the covenant community, and yet, he did not fully grasp (at this point anyway) what the Spirit of God was up to concerning Jesus. Jesus had told Nicodemus that the Spirit (like a wind) blows wherever it pleases. It cannot be kept in a box, contained, controlled or predicted. For followers of Jesus, it’s simply our job to try and keep up with the movements of this Spirit. Well, this week the Spirit is about to blow Jesus right through the region of Samaria, which is an unusual move on Jesus’ part because most Jews, as we well know, avoided Samaritans like the plague due to longstanding racial hostilities. There was an unspoken travel ban on crossing this border. But the text says Jesus HAD to go through Samaria; there was some radical boundary crossing Jesus HAD to do; and some walls the Spirit HAD to break down concerning certain categories of who is invited to fully participate in the Kingdom of God. Last week, Jesus and Nicodemus spoke at night under cover of darkness. This week we find Jesus sitting beside a well at high noon in broad daylight, conversing with a Samaritan woman. As someone who questions Jesus, her story in some ways parallels that of Nicodemus. For example, Nicodemus was thinking too literally about being “born again” and how to accomplish that exactly; the Samaritan woman is thinking too literally about “living water” and how she can get her hands on enough of it so that she will never again go thirsty. They both need to take their thinking to another level, a spiritual level. Nicodemus thinks that his physical birthright as a Jew gives him correct standing with God. The Samaritan woman thinks that worshiping at the correct location in the correct temple is what makes a person right with God, and both desire clarity and insight into these matters. Jesus will have to open up both of their minds to a deeper understanding of the work of the Spirit and how a time is coming and is already here—when the Spirit of the Most High God will not live in “temples made by human hands” (Acts 7:48), but will be, as the prophet says: “poured out upon all flesh” (Joel 2:28), upon “all whom the Lord our God will call” (Acts 2:39). You see, people’s bodies are meant to be temples where God’s Spirit resides (1 Cor. 6:19). And because of that democratizing, eschatological reality, true worshippers can worship the Father in spirit and in truth anywhere and everywhere — under an oak tree, in a field, on a mountaintop, or right here in this chapel today. And likewise, anyone can become a mouthpiece for God, can prophesy about God—regardless of gender, class, age, race, or status. In many ways, the Samaritan woman here is Acts 2:17-18 and Galatians 3:28 personified and prefigured. There are many similarities between Nicodemus and the Samaritan woman, but there are important differences too. She is not the preferred gender in a patriarchal society; she is not of the chosen people, the pure-bred Jewish race; she is without social power or standing, particularly considering the fact that she has no husband. And yet, Jesus makes time for her, HAD to go through Samaria to speak with her. If you look at the icon above, you will see an Eastern Orthodox image of the Samaritan woman from our story today. 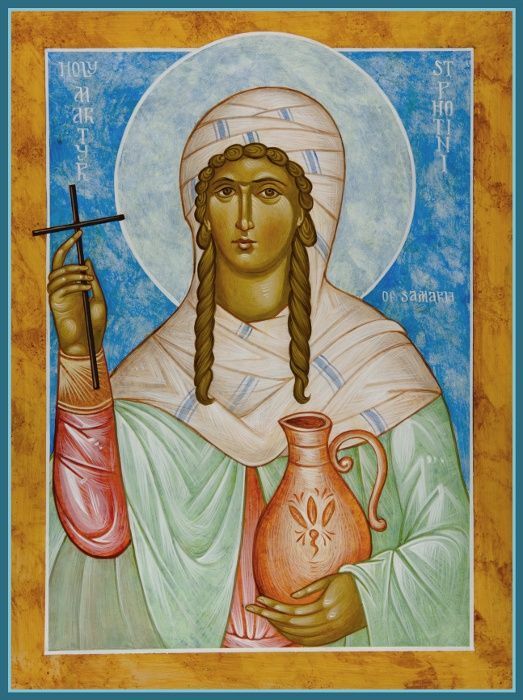 Church tradition relates that the Apostles baptized her with the name “Photini” or “Photine” meaning “enlightened one.” Her feast day is celebrated on Feb. 26 in the Greek tradition and is celebrated today, March 20, in the Slavic tradition. But the history of Western interpretation for Photine has been unkind and unfair, because of her five husbands. I wonder how many sermons we’ve all heard condemning her adulterous lifestyle, her promiscuity. I’ve often heard that the reason why she was at the well at high noon was to avoid the gossip and the finger-pointing of other morally superior women who would’ve come to get their water at a decent hour of the morning, in cooler temperatures. Yet nothing in the tone of these verses conveys that Jesus is condemning the woman and her history. That tone belongs to centuries of commentators, not to Jesus. Jesus’s words here appear to be more a statement of fact than of judgment. I hear a note of empathy and compassion here, rather than condemnation. You see, the Samaritans followed the same Laws of Moses that the Jews had in the Pentateuch (the first five books of the Old Testament). And so, according to those laws, women could not initiate divorce, but a husband could. We have assumed that divorce was something she chose or caused, but that’s not necessarily true. It could have been something done to her. According to Deuteronomy 24:1, “If a man’s wife becomes displeasing to him, because he finds something indecent about her, he could write her a certificate of divorce, and send her away from his house.” This left the woman in a vulnerable position. The reasons for a husband’s displeasure were expanded over the years to include everything from infertility to the quality of her cooking. There is then the possibility that this woman had been passed around from man to man because of some defect in her. There is also the possibility that the Samaritan woman had been widowed multiple times. With high mortality rates in the ancient near East, what are the odds that Photine was caught in a situation of Levirate marriage, where one brother dies and another brother is made to marry her; then another dies, and then another, and so on. A serial widow would struggle to remarry—some men might fear that a curse or a demon was associated with her, and that his own life would be in danger if they wed. This could be why the last male of the family has refused to marry her, but has at least provided her a situation of co-habitation. Whose wife will she be? I thought about this question all week as I thought about Photine. And then it hit me. At the resurrection—at the eschatological marriage feast of the Lamb—she (like we) will be the bride of Christ, because she heard his words and, like her townspeople, believed that he really was the Savior of the world. Isn’t it ironically symbolic that she meets Jesus at a well? If you know your Old Testament, then you know that when a man and a woman meet at a well, a wedding usually follows. Wells were kind of like ancient pick-up joints or singles bars. Moses met his wife Zipporah at a well in Midian, remember? Eleazar found Rebekah, Isaac’s future wife at a well also. And today Jesus meets Photine at a well, and it is the same well where Jacob met his first wife Rachel in Gen 29 also at midday, high noon. And as if to solidify the symbolism in John 4, the Samaritan woman asks Jesus whether he is greater than their common ancestor Jacob, an obvious nod to the earlier story. But her encounter with Jesus is unlike any encounter she’s ever had with a man, because he is no ordinary man. He is not looking to pick her up or pass her around or use her for unseemly means. Rather, he speaks truth, takes her seriously, looks her in the eye, acknowledges her dignity, answers her questions and challenges her assumptions. She asked this man to give her life-giving water and theological answers. And instead, Jesus gives her himself, the faithful Bridegroom (an image already used by John the Baptist to describe Jesus in John 3:29). Jesus, who is greater than Jacob, has come to call all of us to be part of a royal priesthood. Jesus came to reconcile all people to one another and to God. He came to gather together Nicodemus, and Photine, and people like you and me—from all races, and nations, and tribes—to worship and transcend the distinctions that have historically kept us apart. Because God’s Spirit lives in us, we are no longer Jew/Greek, male/female, slave/free. Rather we are “all one in Christ” (Gal. 3:28). As a woman in Churches of Christ, it took me some 40 years to finally hear my own voice in a house of worship. For that reason, Photine inspires me. I admire the way she doesn’t wait, doesn’t hesitate, but uses her voice to engage the Savior, to proclaim the truth that Messiah has come, and to invite her whole town to get to know him better… and they do. Whom you did attract to faith in you, and she has now attained life with you eternally. With news of the living Word made flesh—The Messiah. And did not delay to bring in many sheaves to you. May we bravely go, and tirelessly do likewise. This entry was posted on March 20, 2017 at 1:14 pm	and is filed under Uncategorized. Tagged: John 4:5-42, Samaritan Woman, Woman at the Well, Women. You can follow any responses to this entry through the RSS 2.0 feed. You can leave a response, or trackback from your own site.